Shortly after moving into 'La Californie', near Cannes, Picosso produced a series of paintings representing the interior of his new studio. Amongst these, The Studio at 'La Colifornie is most revealing of Picasso's ability to introduce a wide range of references from other artists' work into his own. The subject matter itself, as well as Picasso's emphasis on the decorative tracery of the studio architecture and the inclusion of a Moroccan brazier in the lower left, instantly recalls Matisse's studio scenes and his interests in North African motifs. 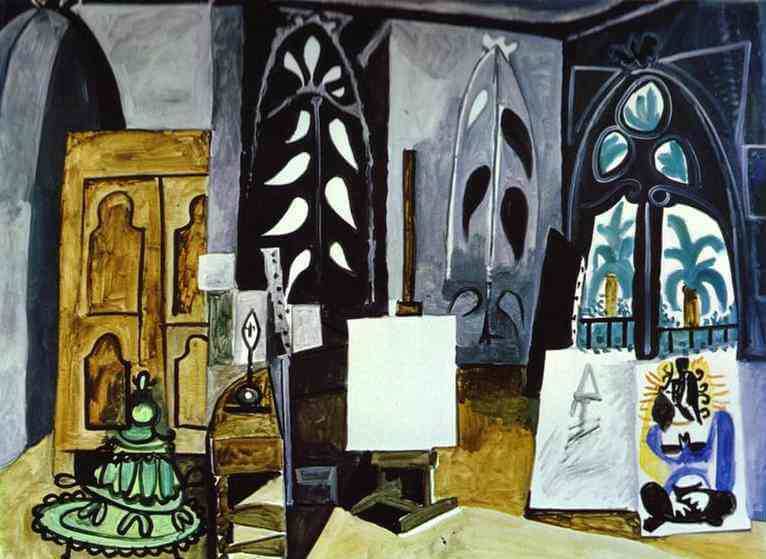 The colour scheme, with its blacks, greys, browns and greens, also forms a direct link between Picasso's work and the most recent studio interiors of his artistic colleague from his Cubist days, Georges Braque (1882-1963). Other past artists are also invoked. Thus, the placement of a blank canvas at the very centre of the studio is a reference to one of most famous works of Gustave Courbet, The Artist's Studio (1855), whilst the orqanization of the space, composition and colour scheme ore reminiscent of Las Meninos (1656), by Diego Velazquez.